A question for those who've had experience with older Baldwin grands. 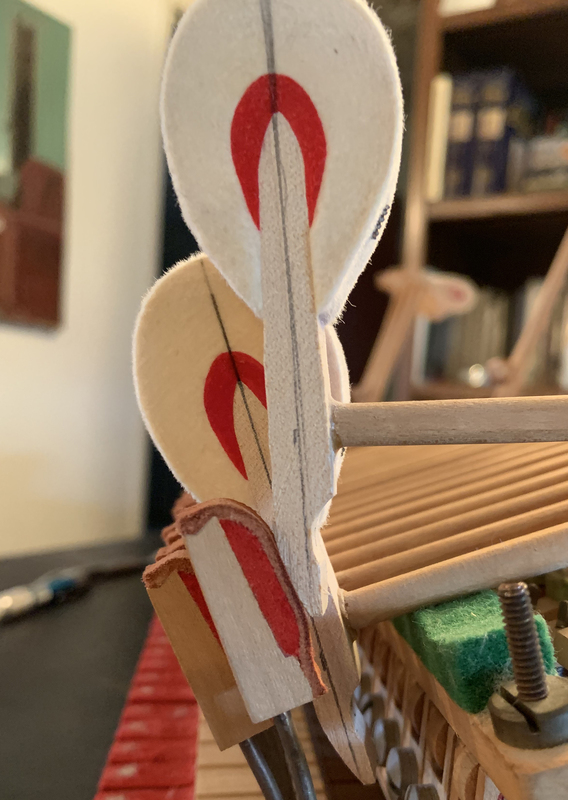 The piano is a 1938 L, and the angle of the tails, which had been replaced about 20 years ago, were about 20º off from parallel with the back checks. It should be clearly visible in the photo. All of the hammers up until the 0º in middle were like this. They were not contacting the back checks properly. Hard to believe I got them to check. I've had one suggestion that older Baldwins may in fact have had hammers like this (and that the replacements were just duplicates of the originals). Any idea? Improper installation. The installer either didn't have the tools to square the tails, the knowledge, or ambition. That was my assumption. I figured that I should investigate in case I was wrong. Here's a profile of hammer #1. While I'm not a hammer expert, the tail doesn't look terribly well executed to my eye. The owner should be informed that this will eventually contribute to premature backcheck wear as well as possible damage to pinning, if not corrected. (You have probably already done this) Not a really huge job, but several hours altogether. The piano is way past that: worn backchecks, loose pinning.The customer was informed. My job was not to make it perfect, but more of a "triage" regulation: The keys were so low that there was zero aftertouch. Get the keys to the right height and make the thing work. That I did. To square off the tails, prop them up high with a straight edge. Use a belt sander lightly while bracing the shanks. For a brace, I use foam pipe insulation on a pipe or dowel. Are you referring to an Erwin mini-belt sander or something else? Are those original hammers? I've never seen an original Baldwin done this way. 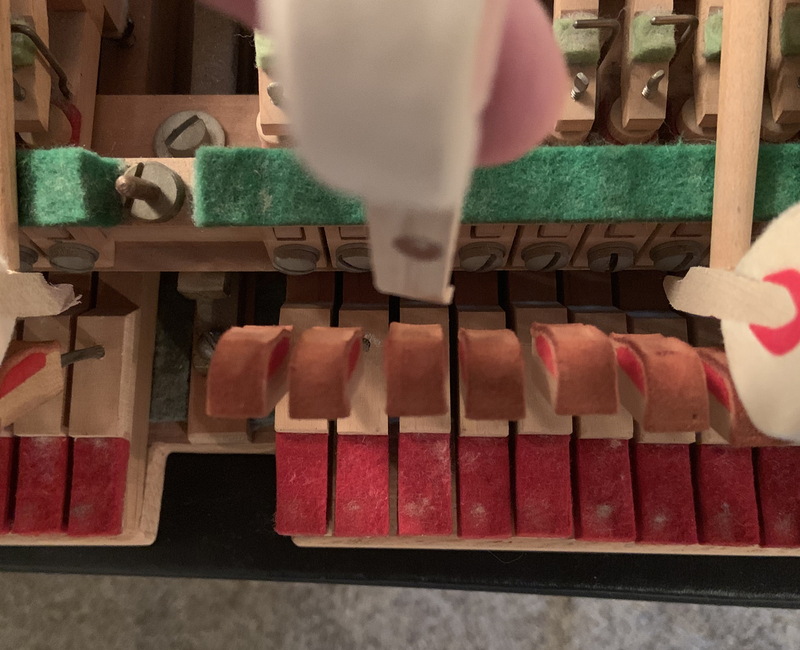 There are several imported pianos that do it now -- they angle the backcheck to match the angle of the hammers -- but it is definitely not recommended. But wait! I'm not sure there's enough moulding left to correct these hammers. They have already been thinned on the wrong side. To correct that you'll need to cut far into the bass corners of the moulding. You may need to replace some of the wood that was tapered off on the wrong side. Medium visc. CA glue to the rescue. Or just turn the backcheck heads to match what's there. sledding; but, in the right circumstances it can be a real help. published in the Journal; but do not remember when that might have been. > But wait! I'm not sure there's enough moulding left to correct these hammers. > They have already been thinned on the wrong side. To correct that you'll need to cut far into the bass corners of the moulding. > You may need to replace some of the wood that was tapered off on the wrong side. Medium visc. CA glue to the rescue. > Or just turn the backcheck heads to match what's there. > More photos might help. > Are those original hammers? I've never seen an original Baldwin done this way. > There are several imported pianos that do it now -- they angle the backcheck to match the angle of the hammers -- but it is definitely not recommended. > A question for those who've had experience with older Baldwin grands. The piano is a 1938 L, and the angle of the tails, which had been replaced about 20 years ago, were about 20?? off from parallel with the back checks. It should be clearly visible in the photo. All of the hammers up until the 0?? in middle were like this. > They were not contacting the back checks properly. Hard to believe I got them to check. I've had one suggestion that older Baldwins may in fact have had hammers like this (and that the replacements were just duplicates of the originals). Any idea? > You are subscribed to "Pianotech" as hgreeley@sonic.net. To change your subscriptions, go to http://my.ptg.org/preferences?section=Subscriptions&MDATE=756%253e45647%253a&UserKey=3feecf45-4a69-4cff-bbb2-fd6c7eaf0569&sKey=KeyRemoved. 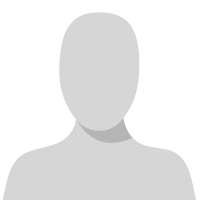 To unsubscribe from this community discussion, go to http://my.ptg.org/HigherLogic/eGroups/Unsubscribe.aspx?UserKey=3feecf45-4a69-4cff-bbb2-fd6c7eaf0569&sKey=KeyRemoved&GroupKey=2bb4ebe8-4dba-4640-ae67-111903beaddf. For something like this it's simpler than adding a hammer tail. Just glue on a few layers of overlapping veneer to fill the space needed, then round them off with the sander. You can remove them from the stack and use a Spurlock tail-arcing jig, or leave them on the stack and do it faster like Jon Page says: support them with a board or long hammer shank clamp (a la Spurlock) and shape them with a belt sander (a regular hand-held belt sander, not the little mini-sander). It's scary at first, but really not hard. Just eyeball it and lightly kiss the tails with the sander with the belt traveling down along the lengths of the tails. Appreciate the clarification re: belt sander, but would also appreciate more specific dimensions of tool. I'll try to look them up later, but I wouldn't want to use the variety I currently have. Hi Scott, Just taking some time to go through the postings.. If the hammer assemblies and the back checks are in good enough shape, you may square the back checks to the tails. I have done that myself a few times and have (so far) not seen any problem being caused by that. Question to colleagues; is that an option and if not, why no? A back check which is angled to match the tail nudges the hammer over a bit on check. Over time, this will wear the bushings. The only reason for angling is time savings = cost at manufacture. Square to the shank is best. did angle them--but made a mistake and turned them upside down or something when doing it. Then, realizing his mistake and not wanting to buy and bore new hammers (or admit the mistake), simply put them on, thinking no one would notice as long as he could get them to check somehow. Perhaps he assumed that he would be the only tech to work on the piano for the foreseeable future. At the time, he might have been right, but not anymore. This would seem to be the kind of job that would best be performed on some other piano with hammers that are scheduled for replacement and thus expendable, or perhaps my own piano. I do own a grand that I may hang new hammers on--that would be a good place to try these skills. The realistic option in this case (considering the customer's budget and motivations) is to simply work with what's there while explaining the ramifications. The hammer pinning was pretty loose anyway. Just one problem of this old grand. The hammer job in general was not well done--many of the hammers were poorly bored, with obviously deviating angles. When ordering hammers, I get them without the cove. Many times, the cove is too deep for proper tail dressing.